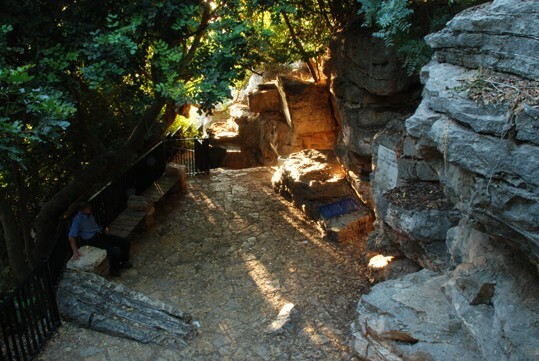 Roman pursuit of R. Shimon bar Yohai and his son, R. Elazar, began following a meeting between R. Shimon, R. Yehudah bar Ilai and R. Yosei at the house of study. The Bablyonian Talmud relates that after concluding speaking about holy matters, they turned to current events. 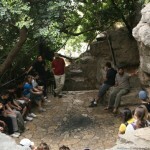 R. Yehudah began praising the Romans for their public works in the Land. R. Shimon bar Yohai countered: “All that they made they made only for themselves; they built market-places to set brothels in them; baths, for their pleasure; bridges, to levy tolls for them.” (BT Shabbat 33b). R. Yosei remained silent. When word of this conversation reached the Romans by way of an informant, and R. Shimon was sentenced to death and forced to go underground. 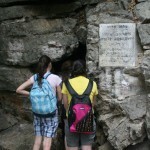 Pursued by the Roman authorities, he fled together with his son, Elazar. 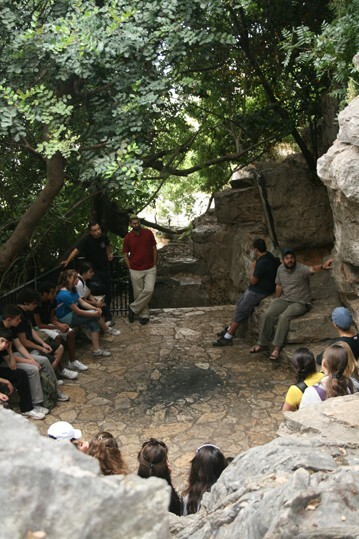 The two hid in various places, including in the house of study of R. Yehoshua b. Hananya, which according to tradition is the site where Peqi’in’s ancient synagogue stands today. 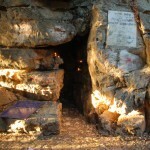 After a period in the house of study, R. Shimon and his son were forced to flee again, moving to the concealed cave in Peqi’in, obscured by a giant carob that to this day decorates its entrance. They hid there for 13 years. 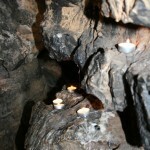 During this period, father and son were nourished by the fruit of the carob and drank from the spring (scientists explain an ancient earthquake created the crevice and the abundant spring within it) until the threat was lifted and they were able to emerge from the cave without fear. 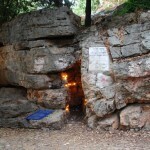 According to tradition, R. Shimon wrote the holy Zohar during these years here. 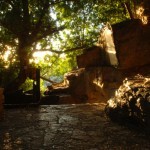 The site is also considered sacred by the non-Jewish residents of Peqi’in, who would not even allow people to pick leaves from the tree. There is a local tradition that the ancient community of Peqi’in was originally on a different hilltop to the north, Ras ‘Abd. Only after the current locale was discovered and made famous on account of this same holy Tana and the abundant spring, did the residents of Peqi’in move to the present location, where their lot was greatly improved due to the rich soil and other virtues of the place. At that time, and for about 1000 years, Peqi’in was a totally Jewish settlement. 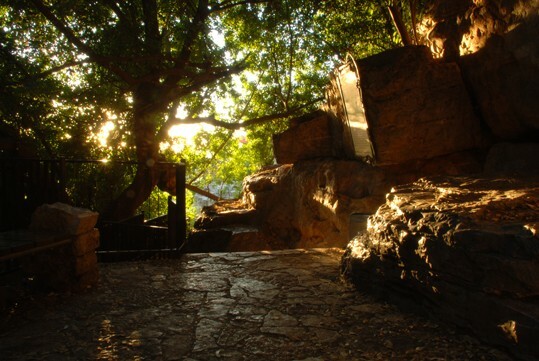 One of the main proofs of the ancient history of Peqi’in’s Jews, according to the scholarship of President Yitzhak Ben-Tzvi, is the old age of the carob tree located at the entrance of R. Shimon bar Yohai’s cave. In 1844, R. Haim ben Dov Horowitz wrote in his book Hibbat Yerushalayim: “It is written in Midrash Talpiot that R. Yaakov Prago heard from R. Yonatan Galanti, who heard from the holy Medaber, one from another all the way back to R. Shimon bar Yohai, that every Sabbath eve, the carob tree would turn into a date tree, as it is written, “the righteous bloom like a date palm” (Ps. 92:13). 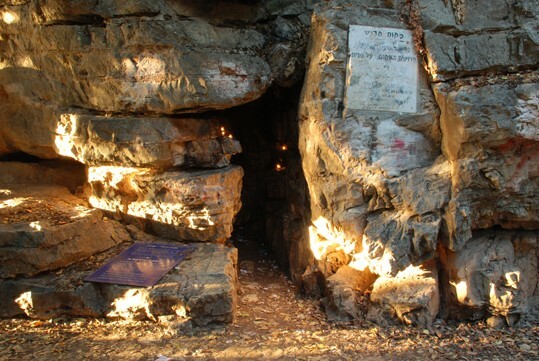 The carob is the property of the Jewish community, but, together with the cave, it also sacred in the eyes of the Christian and Druze village residents, who call the cave “Bani Ya’aqub” [sons of Jacob], thereby specifying that it belongs to the Jews. 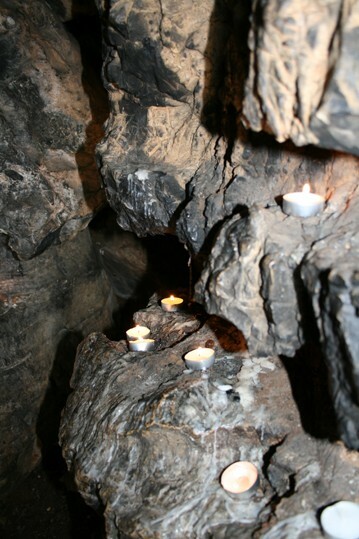 Jews and Arabs alike deposit containers of oil, candles, and coins at the cave’s entrance. 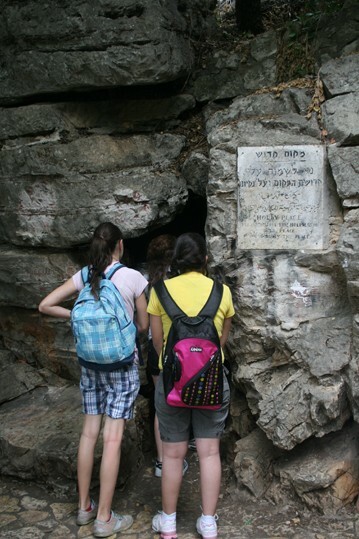 “We set out hastily for the morning prayers at the mouth of the cave, where the Tana R. Shimon bar Yohai and Elazar his son hid for thirteen years. 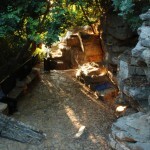 The carob still stands there at the entrance to the cave. 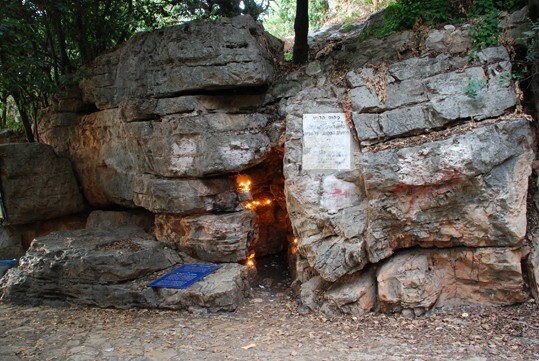 We prayed there together under the shade of the carob, and recited from the Zohar at the cave’s entrance, but we did not enter. We also took some of the carob leaves in our pouches, as many as we could carry, since it is widely known for its wonderful remedial powers and value, even for keeping in one’s home.